Media on the Raymarine stand at METS to view the latest technology. 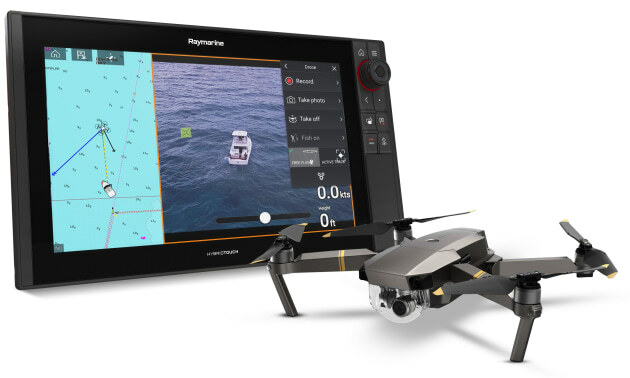 Raymarine’s Axiom UAV app integrates aerial imaging from a DJI Mavic Pro drone with a boat's MFD. METS provided Raymarine with the ideal global launching pad for several new 2019 products. First up was a new flagship model in the company’s Axiom family of multifunction displays, the massive 24-inch Axiom XL. The largest and most powerful MFD in the Axiom lineup, Axiom XL provides the largest screen area of any current Raymarine display, making it ideal for glass cockpit applications on boats with a full suite of integrated electronics. Raymarine also took advantage of the global forum to release a new line of VHF radios. Sporting a new design inspired by the Axiom screen family, the new models include the compact Ray53 and two full-size VHFs, the Ray63 and the Ray73. Each offers built-in GPS and wireless microphone options for greater convenience on board. Also on display was Raymarine’s Axiom UAV app, which integrates aerial imaging from a DJI Mavic Pro drone with the company’s sophisticated marine electronics. The system allows the drone to be controlled from the helm right on the Axiom MFD’s touch-screen surface using simple and familiar gestures, automating tasks such as launch, airborne imaging, in-flight navigation and return to boat. The drone gives anglers a bird’s-eye view of everything going on around the boat, functioning as a virtual tuna tower, spotting surface activity, or revealing the location of nearby drop-offs or patches of aquatic vegetation. It’s also the ideal way to record the fun as a big catch comes aboard. ClearCruise AR helps is designed to help captains make smarter and faster navigation decisions. While the Axiom UAV system drew its share of oohs and aaahs, it was the company’s Clear Cruise Augmented Reality technology that most impressed buyers visiting the company’s display. 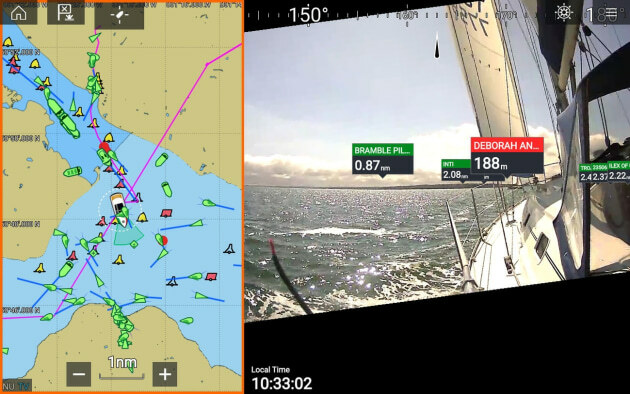 Using HD video and AR200 advanced image stabilisation technology, Raymarine ClearCruise AR helps captains make smarter and faster navigation decisions by providing high resolution imagery of what’s ahead of the boat, complete with visual overlays indicating nearby navigation aids, AIS traffic and destination waypoints. The blended technologies provide unrivalled awareness of potential navigation hazards.